5% DA from July 2017 for Armed Forces Officers & Personnel Below Officer Rank including Non-Combatants(Enrolled) - MoD Order Dated 3rd October, 2017, No. 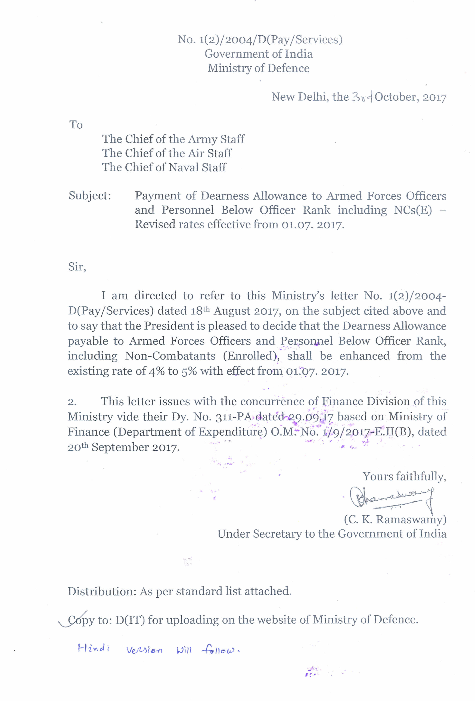 1(2)/ 2004/D(Pay/ Services), Government of India, Ministry of Defence, New Delhi, the 3rd October, 2017, To, The Chief of the Army Staff, The Chief of the Air Staff, The Chief of Naval Staff, Subject: Payment of Dearness Allowance to Armed Forces Officers and Personnel Below Officer Rank including NCs(E) Revised rates effective from 01.07. 2017.